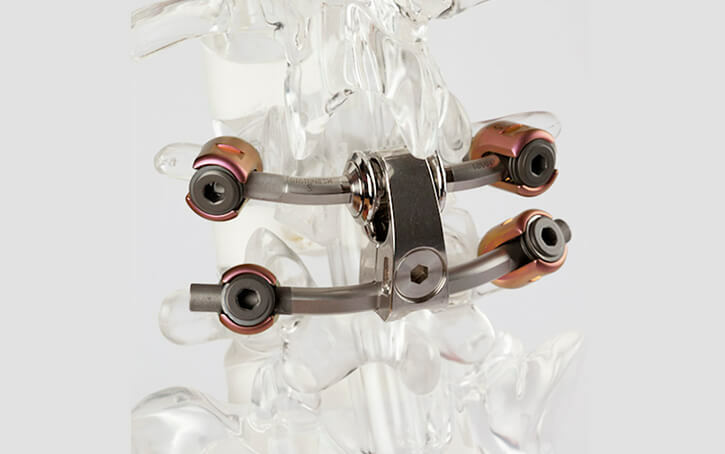 The Modular TOPS System—the predecessor of the Nexux™ System and an early member of Premia Spine’s motion preserving products—was tested at Loyola University (Chicago) by Professor Patwardhan, a leading spine investigator. Other contributors to the research included Drs. Tzermiadianos, Voronov, Geisler, Lauryssen, Cappuccino, and Renner, along with Mr. Carandang, Havey, and Fleischer. The team performed a Biomechanical Evaluation of Total Facet Arthroplasty System (the Modular TOPS System) after completing a laminectomy and facetectomy on the lumbar spine. This study evaluated the biomechanical effect of a facet arthroplasty system to restore motion and stability to a lumbar segment after complete laminectomy/facetectomy. Seven human lumbar spine specimens (L1-sacrum, age: 42.6±13.2 years) were tested (i) intact, (ii) after L4 laminectomy and L4-L5 facetectomy, and (iii) after insertion of the Modular TOPS at L4-L5. Specimens were subjected to moments in flexion (8Nm) and extension (6Nm) under 400N compressive follower preload. Lateral bending (±6Nm) and axial rotation (+5Nm) were tested without preload. 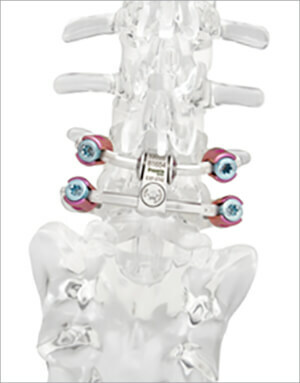 The L4-L5 range of motion (ROM) was recorded. Furthermore, stiffness (slope of the load-displacement curve) in flexion and extension was measured in the high flexibility zone. Repeated-measures ANOVA was used to determine statistical significance (α=0.05). The laminectomy/facetectomy significantly increased L4-L5 ROM over intact for all loading modes: flexion-extension ROM increased from 9.8±3.0 to 13.0±4.9 degrees (p=0.008), lateral bending increased from 7.3±2.2 to 7.9±2.6 degrees (p=0.043), and axial rotation increased from 2.6±0.9 to 5.2±1.7 degrees (p=0.001). The Modular TOPS System restored ROM to intact levels in flexion-extension (7.8±1.6 degrees, p=0.093) and in lateral bending (7.3±3.4 degrees p=0.947). While axial rotation with the Modular TOPS system device remained significantly larger than intact (3.8±0.8 degrees, p=0.002), TOPS significantly decreased axial rotation compared to laminectomy/facetectomy (p=0.009). After laminectomy and facetectomy, stiffness in the high flexibility zone showed a strong trend toward decreasing in flexion (p=0.59) and was significantly smaller in extension (p=0.028). 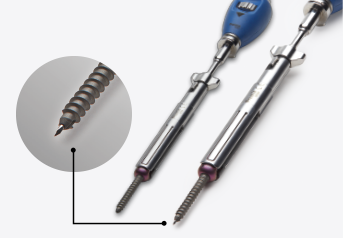 The Modular TOPS system implantation restored stiffness in both flexion and extension to intact values (p>0.47). After completing a laminectomy/facetectomy, the ROM increased and stiffness in the high flexibility zone decreased, suggesting segmental instability secondary to surgical decompression. 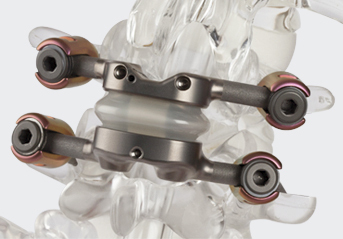 The Modular TOPS device restored stiffness (i.e., stability) of the implanted segment in flexion and extension to intact values. ROM was restored to intact levels with the TOPS device in flexion-extension and lateral bending. While axial rotation remained larger than intact, the motion was less than the destabilized condition and was within the physiologic norms in the literature. We conclude that the Modular TOPS system device can restore stability after surgical decompression with laminectomy and facetectomy, while permitting physiologic norms of motion.